Happy February! I know, the first was yesterday, but I had important things to say yesterday. I wanted to share something fun in time for Valentine's today. You won't see a lot of lovey-dovey posts here this month, I'm just not jumping on that train. BUT, I love you so much that I wanted to make sure you had something cute to use in case you have class parties coming up or celebrate Galentinte's Day with the gals! 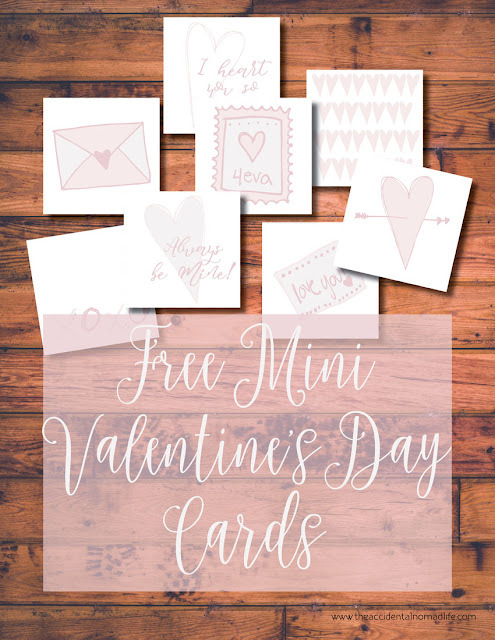 These cutesie little cards that I whipped up for you are hand illustrated by your's truly, the font is from Creative Market. Sign up and snag all of their amazing freebies like I do!!! Woop! Anywho, they are sized to 2x2 when folded, 2x4 when flat and they would make the perfect little tag for a bouquet, a snack bag, a chocolate bar - they're the ideal size. Click the image to be taken to the download! Aren't they darling??? They come 8 on a sheet, so they should make for simple printing for classes or friends!!! If you use them, please share an image on social media (like Instagram) and use the hashtag, #tANLprintable, so I can see the fun ways you use them.